So, after a tumultuous week, all twenty sides have taken the field. No prizes for the highlight of the opening round of games but the cruel nature of the scheduling –where Japan were forced to play the two favourites in their group within four days- means Eddie Jones’ side were comfortably and none too impressively subdued by Scotland. Vern Cotter’s side has come to the table with little fanfare, largely as a by-product of consecutively awful Six Nations performances but they should not be underestimated. On Wednesday, the Scots, due to the whimsical nature of scheduling and matters out of their control, were treated with the sort of antipathy reserved for one of their near neighbours. True, the Japanese engines eventually stalled –too easy to insert a joke here- but Scotland were still very impressive in dispatching a tricky, confidence-imbued Japanese side. We’re inclined to think that we dodged a serious bullet by avoiding a full synopsis of what is now the most interesting quintet in the tournament, Group B. Japan, would admittedly, have been given pretty short shrift. Still, with money in our hand we’d have no hesitation in predicting that South Africa and Scotland will escape will escape this group, though the order in which this happens has taken on a mask of uncertainty after Japan’s stunning victory last Saturday. 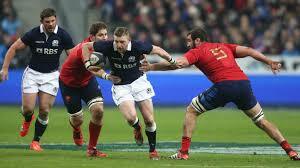 The elusive Finn Russell will play a big role if Scotland are to go deep in this tournament. Scotland came into this World Cup with virtually no fanfare surrounding them. And, as somewhat of a quirk, until the IRB rankings are updated next week, they remain the fourth highest ranked side in Group B, behind South Africa, Samoa and Japan. We’ll say now, potentially to our complete embarrassment in a few weeks’ time, that this Scottish side -controlled by the increasingly impressive, Finn Russell, has an excellent chance of making their second ever Rugby World Cup semi-final. Naturally, there are a number of more easily fancied sides to choose from, but we’re inclined to think that the South Africans, rather than being even more dangerous now, are actually ripe for the taking. The ‘Boks enter a balls-out war with Samoa on Saturday and there is likely to be damage from this –actually and not collateral- not to mention the fact that the Samoans could turn over their wounded rivals. Scotland, like Ireland, have been well treated by the fixture list and the benefit of this really can’t be overstated. Also this weekend, going hand in hand with the South Africa Samoa slobber-knocker, we have the clash of England and Wales in Twickenham on Saturday night. English coach Stuart Lancaster, to the chagrin of many, has made the dull and somewhat depressing decision –we’re talking bigger picture in this regard- of selecting the bread and butter Owen Farrell over the more creative, though admittedly slighter, George Ford for the pivotal clash with their western neighbours. The Welsh, under Warren Gatland, are now famed for ‘Warrenball’ – smash it up in midfield and win every possible physical collision. Lancaster, mindful of this, has chosen a mind-numbingly unimaginative English ten, twelve, thirteen connection of Farrell, Sam ‘the Second Coming’ Burgess and the one trick defensive pony, Brad Barritt. Out-halves or first five-eighth –depending on where you’re sitting- have always been granted a sort of dispensation for both defensive ability and indeed physique. David Humphreys, Ronan O’ Gara and now, Quade Cooper have all enjoyed enormously successful careers despite clearly lacking the defensive presence of Jonathan Sexton, Jonny Wilkinson or Dan Carter. George Ford, by the grace of genetics, falls into the former group, a nimble twenty-two-year-old who invites plenty of challenging traffic down his channel. When it comes to defence, there is no question that Farrell enjoys clear superiority over Ford. George Ford, seen here touching down against France in this year’s Six Nations has been dropped by coach Stuart Lancaster for this weekend’s pivotal encounter against France. However, little more than twelve months ago, Ford was offered the number ten jumper to try and give some impetus to an English attack so plainly lacking in craft or guile. Ford’s arrival has been widely lauded and England’s outrageous victory over France in March, where there backline sparkled, was largely inspired by the innovation of the Bath man in the pivot role. Jamie Joseph, injured this weekend –and perhaps for longer- was probably the greatest beneficiary of Ford’s playing style so in Joseph’s absence, the need for a creative out-half has been, rather perversely, deemed superfluous. Excepting that Barritt is, as they say in baseball, a defensive whizz only, Ford could still work wonders for the underrated line running of Sam Burgess. The Yorkshireman is lazily regarded by union fans as a battering ram -these the same fans who now fawn over Sonny-Bill Williams- but there is far more to the Yorkshireman’s game than catch and smash. With Farrell inside, however, there is no chance of witnessing the more subtle aspects of his game. Stuart Lancaster has proven his continued inconsistency in terms of his selection for this weekend’s centrepiece, with the omission of Ford. Already he has acceded to Warren Gatland, acknowledging that he is going to try go bang with the best in the business. The great shame, of course, is that Lancaster has shown to the world and more importantly his young out-half that when push comes to shove, quite literally, might will always be right. The bigger issue here was highlighted by New Zealander Ben Smith in a Sunday Times interview last weekend. Smith, who spent a year in Bristol after high school–playing with Old Colstonians- noticed that after training everyone would head straight for the gym ignoring the idea of spending extra time on ball skills. Lancaster’s decision to drop Ford is merely a by-product of this disposition to strength over skill. Good defenders should never be taken lightly but ball-players, genuine game breakers like Ford and Finn Russell, should be cherished.